Isn't it nice when you find yourself welcomed with open arms? We get a whole column to chose from at Mexican Radio! They know we're coming and have prepared in advance. One of the issues in any restaurant is the ingredients used to prepare the non protein ingredients. Mexican restaurants have traps galore, with many using chicken stock in the rice or lard in the beans. My 11 year old vegetarian daughter forgot to ask and when she took her first spoonful of the Corn Chowder she got a mouthful of something that didn't grow in the ground. Our waiter was very helpful and took the time to work out my meal even though he was hurrying to get our table of 10 taken care of. 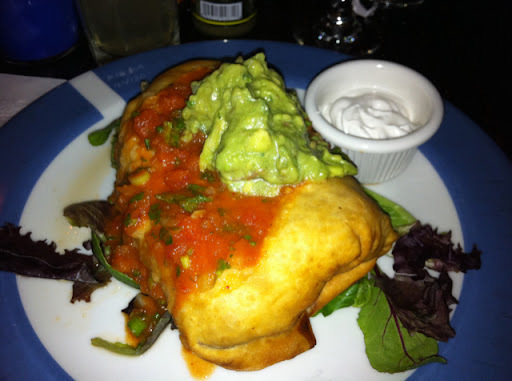 My favorite Mexican dish is a Chimichanga, you know I'm a sucker for anything fried, and this is basically a fried burrito. I got mine with rice, beans, vegan soy cheese, seitan, onions and peppers. Although the shell wasn't as crisp as I'd have liked it was still a good chimi. The guac had a hint of spice, (not that it mattered much with 3 different bottles of hot sauce at the ready), the pico was bright and the soy crema added a balancing coolness. As for the contents there was nothing in particular that stood out but every bite had a nice flavor and there was enough seitan pieces to give you the feeling that you were eating something substantial. You won't leave hungry, that's for sure. There is a cheese sprinkled on the beans which I was assured was vegan and the rice was cooked in veggie broth. That's a chunk of seitan in the middle. As I've said before, Mexican food is either above the line or isn't. Mexican Radio produces consistently decent food which is above the line. The carnivores enjoyed their meals as well so this was a perfect choice for a mixed group. I think I'd put working through their tequila selection, one shot at a time, on my bucket list as well. Alright! 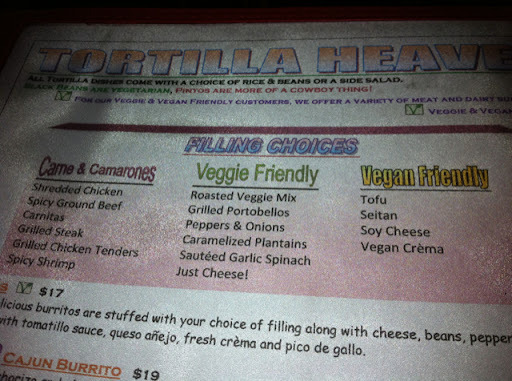 I love Mexican restaurants with vegan menus! Have you been to Harry's or Benny's Burritos in NYC? There's a Harry's in Westchester (they deliver, woot!) and I can get almost anything I want vegan. Wow - That is enough food for 3 meals (for me). I'm enjoying your blog! 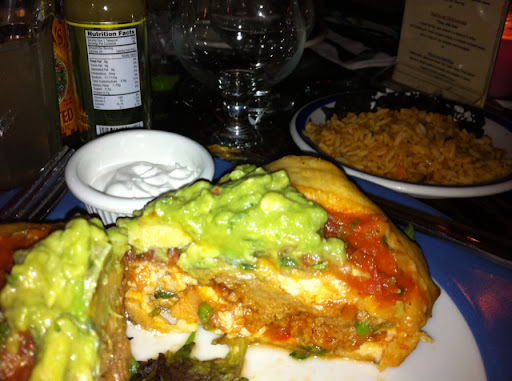 Mexican Radio is one of my fave NYC restaurants - I'm a veggie & my mom tries to eat as close to vegan is possible. My brother, father & fiance are all die-hard carnivores... I love the atmosphere of this spot AND how freaking easy they make it for a restricted eater to pick a delish meal! Benny's and Harry's? I'm gonna go find it. My quest is to find places with options! Thanks. That's exactly the reason I am on a quest to find those places where people in both camps can eat. I also love to give the carnivores a "taste" of what vegan food can be like. Some like it, some are impressed, others just don't care for it. It does provide a different color to the culinary canvas. Is Half a Vegan Better Than None?